We are proud to honor these inspiring groups who are are helping our community to be a special, clean, green, and beautiful place. The owners of these properties have not only provided green space and beautiful plantings, but have maintained them for a long period of time, sharing their beauty and environmental benefits until they become well-established and mature. Isn’t their parking lot the most beautiful in Kailua? Those monkey pods are providing beauty to the buildings and to Pali Highway, while sequestering carbon non-stop. And the walkway covered with a lattice and hau is a wonderful example of the traditional use of the beautification and protection from sun and rain provided by this beautiful native tree. Thank you to Adventist Health Castle for providing this example of traditional and modern landscaping we all can enjoy! Remember when you looked down on Kailua and saw an area covered with coconut trees? There was a reason it was named “Coconut Grove”. But nothing lasts forever, even trees. When many of those coconuts grew to be so big that they were dangerous and difficult to trim, many property owners had them removed. But Kailua Racquet Club is planning for the future with companion planting. With far-sighted consideration for the community, they have planted young coconuts beside each tall palm. When the mature trees become difficult to maintain and must be removed, the next generation will be ready to take over the job of keeping Kailua clean, green, and beautiful. LKOC encourages you to consider companion planting for the future. Many of us will remember the barren parking lot that was once across from Kailua District Park. Now the area has been beautifully landscaped with a series of gardens, all easily visible from the street. The open areas are surrounded by vibrant plantings that brighten the area and provide filtering of the water and chemical pollution. Notice the trees that are appropriate to the area that will become more beautiful as they mature. Thank you to D.R. Horton for implementing an environmentally responsible and beautiful green space for all of us to enjoy! ​Hui O Koolaupoko has re-planted the area next to Ka’elepulu Stream near the bridge next to Buzz’s parking lot. The Popoi’a Street Storm Water Project filters the water flowing into the stream, and then the ocean, with pervious pavers, rain gardens and native plants. 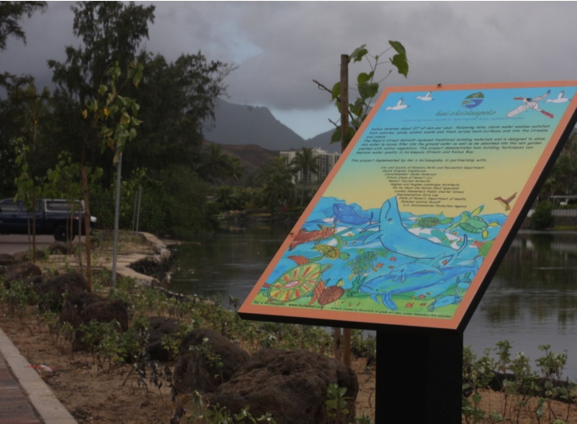 With the support from government and private organizations, including Lani-Kailua Outdoor Circle, the area looks beautiful, and it is keeping the stream alive and clean. 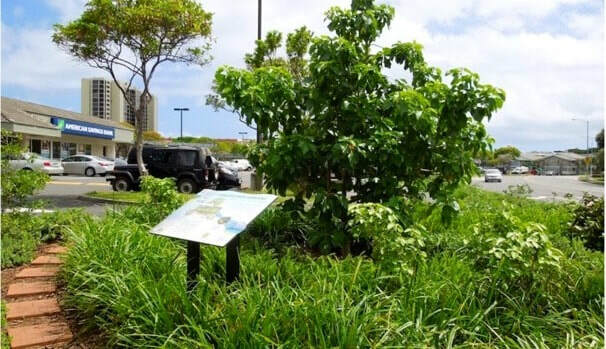 Also being recognized for creating a rain garden is Smart Trees Pacific, at the corner of Hahani Street and Hamakua Drive. The Smart Trees’ rain garden isn't just a pretty face. It filters the water running off of all the pavement in that area, cleaning the rainwater before it flows into our marsh. It’s another beautiful project that is improving our environment. ​Another beautification award was presented to Hardware Hawaii. 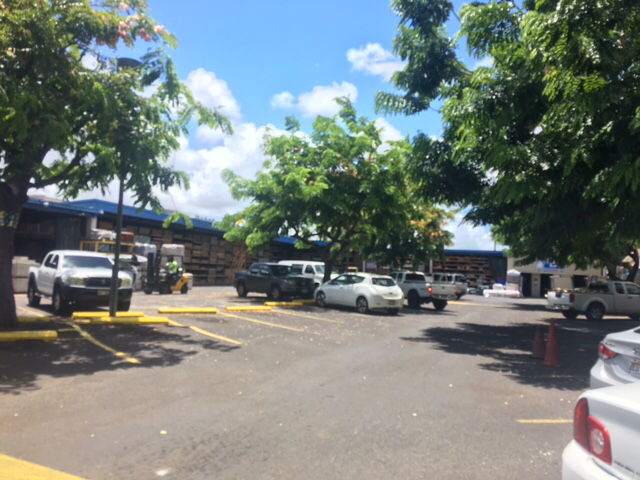 When you go to Hardware Hawaii, don’t you love to park under their trees? The spaces under those shower trees are always the ones everyone wants. They have some of the best parking lot trees in town. They also maintain the planting pockets for street trees in the sidewalk in front of their store, AND they keep the gutter swept. The City and County can’t keep up with the leaves and seed pods the trees drop, but Hardware Hawaii cleans it up, even though they don’t own the property. (Other businesses, hint, hint.) Thank you, Hardware Hawaii! Progress is being made at our Boettcher Estate, in large part because of the Pali Lions Club. In three work days, they have helped us remove invasive species (some of them pretty poky), cut back wild vegetation blocking the house, paths, and driveway, and help cart off truckloads of yard waste. They weren't called "work days" casually. Those Lions are hard workers, even on sweltering days. We’re not planning anything fancy, just clean, green, and beautiful. Look for further improvement in the grounds, and more work days coming up. Join us for this rewarding work.